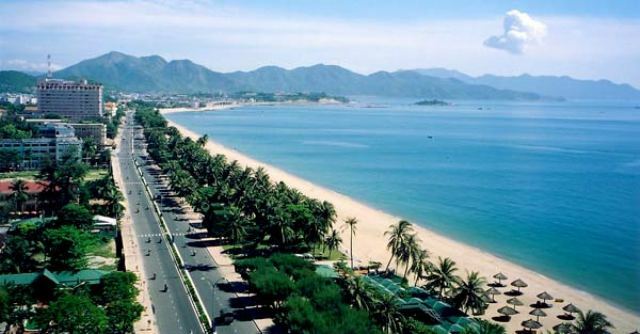 Nha Trang Bay is located in the province of Khan Hoa, at the southern maritime area in Central Vietnam. With a surface area of 507 square kilometers, the bay stretches between Cay Cape in the north and Dong Ba Cape in south. The coastline consists of two different parts – continental and island. Both contribute to a great amount of biodiversity as well as the development of several maritime activities in the fields of tourism, transportation, aquaculture and product processing. The famous bay has a number of popular islands and beaches, which are constantly visited by tourists and travelers coming to Nha Trang. Nha Trang Bay is considered one of the most precious nature models in the whole world due to its exotic and rare ecosystem found beneath the tropical sea. The renowned bay has about 10 Salangane islands. Every year, the Khanh Hoa Province earns millions of dollars just from the exploitation of bird’s nest in Salangane. The underwater surface of the bay is also home to 350 types of corals, 190 kinds of fishes, crustaceans, mulluscas, sea grasses, weeds etc. Known as one of the 29 most stunning bays throughout the world, Nha Trang Bay is home to 19 islands including Mun Island, Mieu Island, Tre Island, Tam Island and Yen Island. Because the water in the bay is warm all year round, the bay is ideal for different water sports activities like scuba diving, swimming and snorkeling, which brings more and more people from different parts of the world and every corner of the country. One special adventurous activity that you can try to witness the superb view of the bay is the 20-minute balloon ride at a height of 150 meters. Hon Mun Island is home to several Salangane caves that can be seen from your boat. Traveling using a glass-bottomed boat lets you witness the beautiful corals underwater. In 2001, Hon Mun Protected Area was the first sea reservation zone to be established in the country, with a total area of 160 square kilometers covering several nearby islands such as Hon Tre (the largest island), Hon Tam, Hon Cau, Hon Vung, Hon Rom, Hon Noc and Hon Mieu as well as the surrounding waters. This area is very popular because it is the most diversified coral reef in the country. Its international significance can’t be denied as the variety of corals is similar to the ones found in the India- Pacific ocean international coral reef center. The coral reef in the Hon Mun area comprises more than 340 kinds of corals out of 800 kinds around the world. One great attraction in Nha Trang Bay is the Tri Nguyen Aquarium with its exceptional structure resembling the shape of an old pirate ship. The construction offers an underwater world feeling. From afar, the huge structure looks similar to a fossil ship draped in seaweeds and moss, stranded in the cape. The artificial lake inside is covered with a thick glass. Visitor will experience true excitement as you get surrounded by groupers, red snappers, sharks and eels over 1 meter in length. The largest island, Hon Tre, is now the host of the five-star sophisticated hotel resort Vinpearl Land.